I'm so sorry I didn't have a post for you yesterday! I hate missing Monday posts because it feels like my week got off to a funky start. I'm really hoping that despite the winter weather we're getting that I will have a couple of outfit posts this week! Today, though, I wanted to talk about a jewelry brand I'm absolutely loving (me and everyone else I think) - Kendra Scott! I've loved their designs for awhile now and own one pair of their earrings, but their new colors and pieces have me falling even more in love! I love their black, emerald and turquoise designs, but with spring on my mind I couldn't help but put together a little spring collection with fresh pastels and lots of drusy. How gorgeous is their new rose quartz color?? 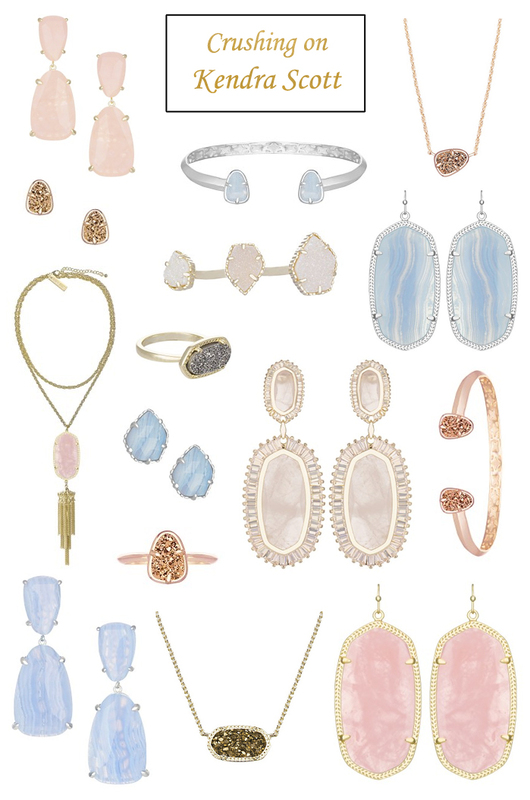 Do you own any Kendra Scott, and if so, what do you have? Which pieces and colors are you loving right now? I'm obsessed with the new Kendra Scott line!! Great post!